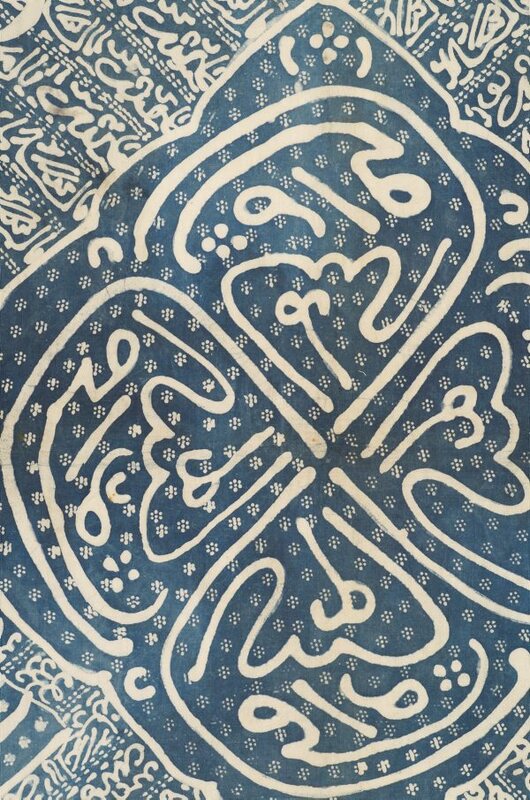 Whilst many of the motifs of Islamic textiles in Indonesia remain consistent with those more globally their meanings and methods of production are deeply imbedded in local custom. When Islam was first adopted in Indonesia it was quickly incorporated into existing religious and cultural practises, likewise those pre-existing cultural forms were employed to express Islamic thought. 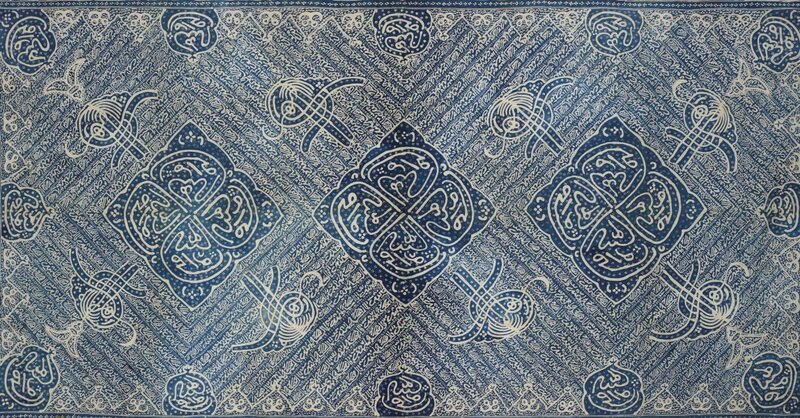 So, where Islamic calligraphy appears in textile design its significance can often be two fold. The text may for instance present an Islamic prayer and also appeal to local belief in the protective nature of talismanic cloths- dual meanings such as these are not always apparent to Muslims more globally. For example this textile conforms to a basic design of a central flower or grid motif with four satellite motifs that was derived from Buddhist mandalas and also used in talismanic textiles. Aside from 'batik cap' (stamped batik) Southeast Asia women continued to be the major producers of textiles in the 20th century. 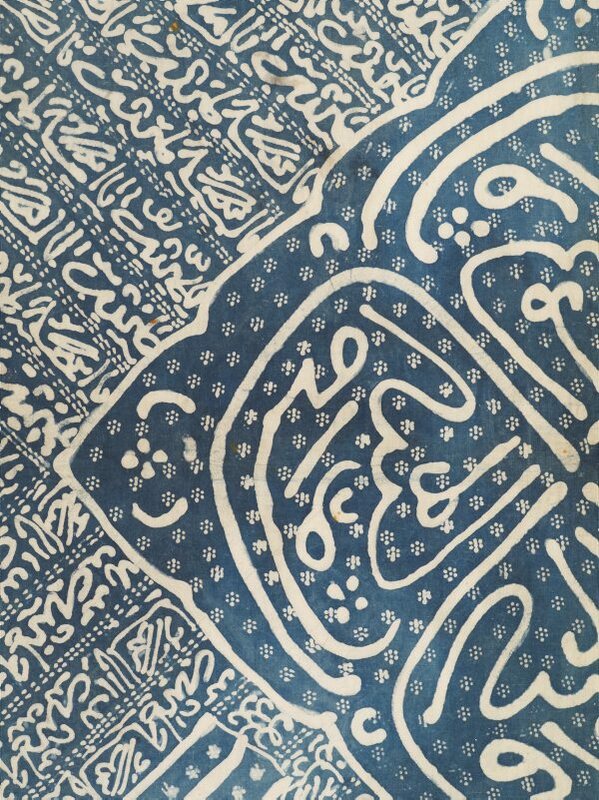 The women who made such textiles were quite often illiterate and so the calligraphy, whilst resembling Arabic lettering was often nonsensical and was used to constitute pattern rather than prayer. The court of Cirebon was one exception and was known for employing literate Muslim men to do work involving the writing of Islamic texts. The top and bottom of this textile are adorned with a white lace fringe. The three central medallions are made up of four repeated calligraphic motifs that form the four petals of a flower. 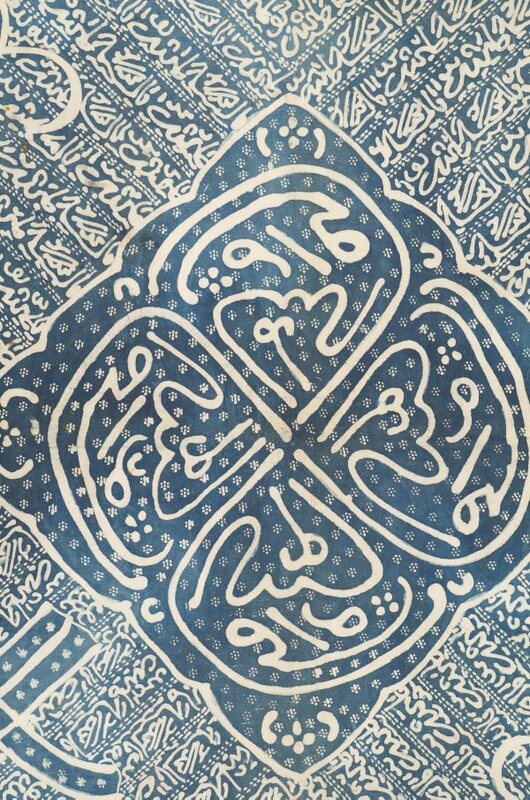 The same calligraphy appears along the edges and corners of the textile. Matt Cox and Natalie Seiz, Look , 'Character Study. The Calligraphic traditions of Asia are beyond words, write Matt Cox and Natalie Seiz', pg. 23-26, Sydney, Sep 2016, 24 (colour illus. ).